Orpheus. Eurydike. Hermes..sets the famous extended poem by Rainer Maria Rilke, from his Neue Gedachte of 1907. It was composed in 2004 but quickly withdrawn. Over the following twelve years I revisited it several times in an attempt to rework it satisfactorily, but without success. However, in 2016 it finally fell into place. The original accompanying large ensemble was replaced with a more standard chamber orchestra, though this includes an alto flute and an extensive part for bass oboe. The original opening "Orpheus" section was largely retained but the others were either recomposed, or completely replaced. 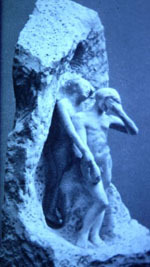 Several sections follow in unbroken sequence: an opening "landscape"; Orpheus in impetuous mood; a brief picture of Hermes; and a final extended phase dealing with Eurydice. I have tried to mirror Rilke's structure and mood with sections successively cold and distant, impetuous, fleeting and hectic, richly lyrical, and ultimately numb. Rilke's poem so poignantly captures the "unknowingness" of the dead young woman, held in a suspended, forgetful, yet accepting limbo, and indeed the tragic inevitability of the story's end-point. With my wife, Marcelle, I have prepared a viable English version, so the work could be performed in translation if wished. Scoring: mezzo-soprano - fl, fl2/alto fl, ob/bass-ob, clt, b clt, 2bsns | 2 hrns, tpt | harp | perc | strings.